Dropdown lists (previously known as Look-up Tables) control many of the fields within the CRM system. These include the Country, Account Type, Sector on the Account record, Salutation on the Contact record, Task Status and Task Type on the Task record, Activity Type on the Activity record, Status, Forecast and Product on the Opportunity record. Each dropdown list can be maintained and customised to meet your business needs. If you have created a new Custom Field you might want to create a Custom Dropdown List to drive that field. To create a new dropdown list, go to Settings/System Setting, then ‘Custom Dropdown Lists’. Select the record you wish to change, for example, AccountType. To create a new list click ‘+ Add’. Give your new list a name and click ‘Continue’. Next add the dropdown items to create your list by typing in your item name and clicking ‘Add new item’. 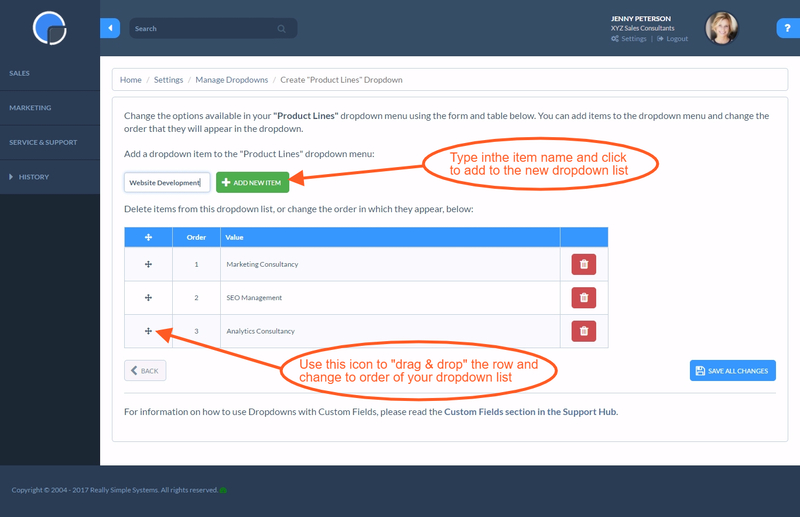 You can reorder your list by “dragging and dropping” the row using the icon in the left-hand column, or delete any items you don’t want by clicking the trash icon. Then click ‘save’. If you then go You can go back to your Custom Field you can update the ‘Look Up Table’ field as required. To edit an existing dropdown list, or Look Up Table, go to Settings/System Setting and click on ‘Custom Dropdown Lists’. Open the list you wish to change, e.g. AccountType, and edit the table as required. You can change to order of the list by “dragging & dropping” using the icon in the left-hand column. Delete any rows you do not want using the trash icon. To delete a dropdown list, open the list you wish to delete and remove all the list entries by clicking the trash icon, then save. 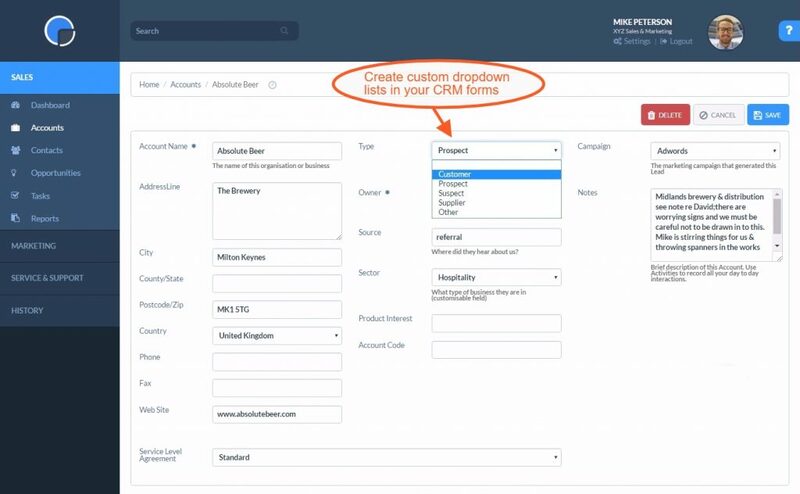 If you want to create a Custom Field where you can select more than one option within the dropdown, you can use Multi-Line Custom Fields, for example for Products, where a customer may buy more than one product from you. Create the LookUp Table as normal and when you add the table to your Custom Field, select the table Type as ‘Multi-Line’. You can change the dropdown list order by “dragging & dropping” the rows in your list. With your mouse, click and hold the ‘+’ icon in the left hand column and drag it to the order position you want. Then release your mouse and save. The dropdown list ‘OpportunityForecast’ has an additional checkbox against each Table Value, labelled ‘Include in Forecast’. Selecting ‘yes’ will allow Opportunities with a Forecast set to that Table Value to be included in your Forecast Reports (although you can also override this in the report generator). For example, Table Values of ‘Forecast’, ‘Upside’ and ‘Closed’ could be flagged to be included in forecasts, while table Values of ‘Not Forecast’ or ‘Dead’ would not be. 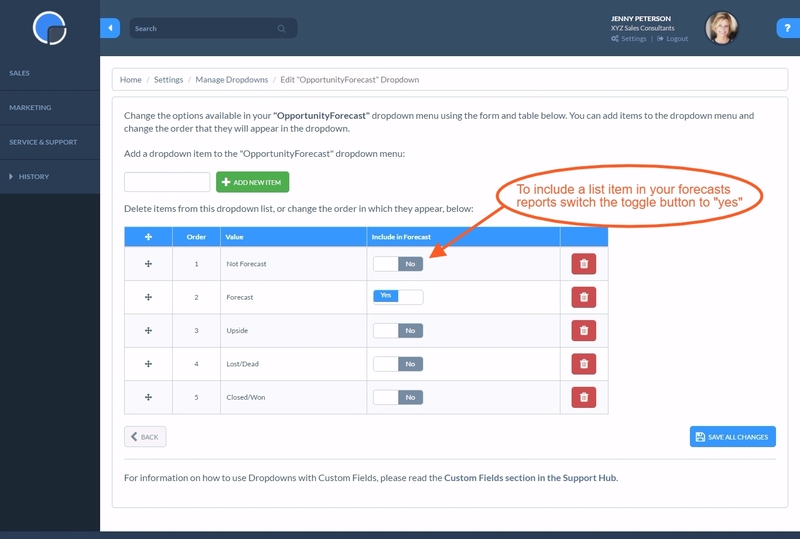 The Derived Tables feature gives a number of options to cross-refer fields within the CRM. For example, whilst an Opportunity or Task is held at the Account level you can add a Custom Field to the form to link it to a particular Contact within the Account. This means you can record which is the main Contact for that Opportunity of Task. The Derived Tables are “hard coded” into your CRM so you do not need to create a new Dropdown List – nor do they appear on the Look Up Table lists. You will need to type them into the Custom Field table using the text format as shown in the list below. The field will initially suggest that you need to create this table – but just save the changes and the CRM will accept your new table. If you then take a look at the form/table you have customised, the Derived Table will appear. In the example below and new field of ContactName with a dropdown list of all the Account’s contacts has been created within the Oportunity. Selected the Contact for the Opportunity and save. You will then be able to run reports on any of these fields.